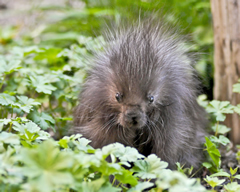 The North American porcupine is the second largest rodent in North America (after the Beaver). These gentle creatures are amazingly adapted to their environment. 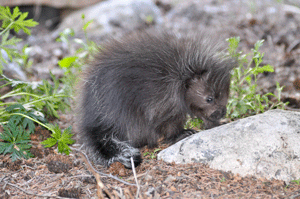 Porcupines can be found in open tundra, deciduous forests, and desert chaparral. Their habitat varies geographically. In the Pacific Northwest, they are primarily ground dwelling, whereas in New York State, they are mainly tree dwellers. The time on the ground varies based on the amount of ground cover for food and protection from predators. 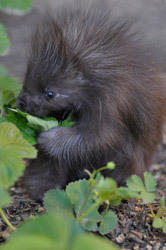 Porcupines move slowly partly because they have short, powerful legs with long, strong claws to help them climb, and partly because they don’t need to run to find food or escape predators. They have an excellent sense of smell, but are quite near-sighted. They tend to live a fairly solitary life, except when raising the one young they have each year. 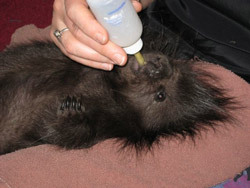 Porcupines are nocturnal, and do not have large territories, although males have larger ranges than females. They are herbivores, and love to eat buds in the spring, which are high protein, but will subsist on bark, evergreen needles, and whatever else they can find in the winter months. Trees with stripped bark is a tell-tale sign of Porcupine presence, and a common reason that land-owners do not like them. Quills are an amazing adaptation. They are modified hairs, and cover almost every part of the body, except the belly. 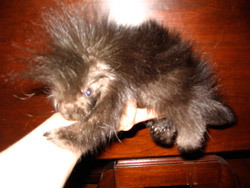 There are about 30,000 quills on a Porcupine. with special quills around the eyes, and extra dense quills on the tail, which they use to “slap” a predator. 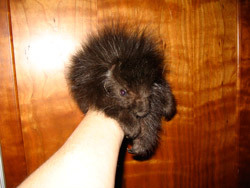 It is a Myth that Porcupines can “throw” their quills, but they are quite fast with their tail, and it does not take much for the quills to attach to flesh. Quills have a small barb at the tip which serves to fasten the quill into the skin, and then will continue to work that quill into the body of the animal, either coming out the other side, or entering organs and resulting in death to the predator in the worst case scenario. Believe it or not, Porcupines make very good swimmers because the quills are essentially hollow, filled with only a spongy tissue. 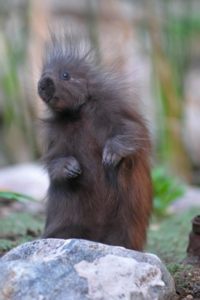 They usually lay flat against the body, but when threatened, the porcupine tightens its skin, raising the quills as defense. Like other rodents, Porcupine’s teeth continue to grow throughout their lifetime, requiring constant gnawing to wear them down. They are well adapted to gnaw the bark off of trees. Females and males come together in October/November for mating, then go their own ways. She will have one young after 210 days. Babies weigh between 400-530g, and are nursed for about 4 months. They become independent at 5-6 months, but will not be sexually mature until 25-29 months of age (Females/males). Females disperse from their mother’s territory, while the young males will often stay in the area. Infant care is provided by the mother alone. For the first weeks, she hides the baby at the base of a tree while she feeds and sleeps in the tree above it. By mid-October, the young is on its own for the winter. They can live up to 18 years in captivity, although the average lifespan in the wild is closer to 6 years. Despite a pretty good defense system, Porcupines do have predators, including fishers, bobcats, coyotes, linx, wolves, and Great Horned owls.